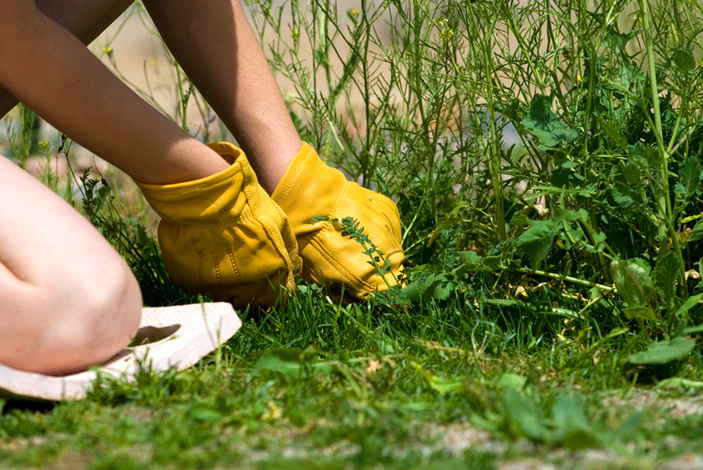 The hot weather is the perfect time for getting rid of weeds. Read below for tips. It’s perfect weather for … what, you might ask, is this heat perfect weather for? Well, the hot days of a Central Texas summer are perfect for solarizing. Our summer heat is like a microwave for killing weed seeds or just cleaning up a plot. You can use clear plastic, like we did this past winter when we were getting our garden ready, or black plastic. Have you gotten into a black car this summer that had been sitting in the sun? Yes, we’re thinking black plastic for summertime, too. First, trim the grass/weeds, etc., in the area you want to clean. Remove rocks or branches that might puncture the plastic. Moisten the ground and cover it with plastic. Secure the edges of the plastic so it lays as flat as possible. You can use rocks, T-bars, two-by-twos — whatever is convenient for you and heavy enough to hold the plastic as closely to the ground as possible. You can uncover the plot in a month. Another option for this perfect weather is to use the magnifying-tenacious properties of vegetable oil. If you have weeds along your sidewalk, anywhere you don’t want them to be, here’s an inexpensive solution: Mix a 50-50 mixture of vegetable oil and water, shake well, and spray on the weeds. The sun will help fry the weeds, and it is friendly to the environment. We were checking our garden journals from the last year (hint hint ): The second week of August came with some serious rains with several places reporting more than 7 inches. No, we are not weather forecasters. However, we would suggest you take a peek at your erosion control. Do you have some plants with a matrix root system that can slow down the velocity of the runoff? Plants such as bunch grass or black foot daisies (Melampodium leucanthum) are good choices “because the extensive fibrous root systems that they develop work well holding the soil in place,” according to the Lady Bird Johnson Wildflower Center. A few suggestions for erosion control plants: little blue stem (Schizachyrium scoparium), inland sea oats (Chasmanthium latifolium), plains lovegrass (Eragrostis intermedia), sideoats gramma (Bouteloua curtipendula), Eastern woodland sedge (Carex blanda), Texas sedge (Carex texensis), and wild red columbine (Aquilegia canadensis). Check with your local nursery. 1. Roses: Apply fertilizer in which the nitrogen is readily available. 2. Are you mulching your plants? We know we sound like a broken record, but it is very important to mulch, particularly during this time of year with the extreme heat. Make sure you cover every square inch of bare ground. 3. Pull expired squash plants, Swiss chard, okra, and non-producing pepper plants to prepare for fall. 4. Unless you recently received large amounts of rain, water deeply every plant, tree, shrub, and your lawn. In the heat of summer, it does not take long for the ground to dry out or for the temperature to rise from the ground to stress our plants, trees, shrubs, etc. 5. This time of year, we need to mulch at least 3-4 inches around our plants, shrubs, and trees. Remember those fruit trees we planted last winter? They are particularly susceptible to the heat factors of August. 6. Now is an excellent time to apply those drip-irrigation ideas. Our gardens are definitely thirsty, and we need to take care of them. • Use low-volume drip or trickle irrigation for garden and bedding plants. Since drip-irrigation sends the water more slowly and more softly, the soil better absorbs the water. • Don’t use the hose to clean sidewalks or driveways; sweep them clean. • Double check your irrigation systems to make sure they are in working order, including sprinkler heads facing the way you want them. • Raise the mower height slightly in hot, dry weather. Mow frequently to avoid cutting more than one-third of the leaf blade on any cutting. Our friends in the soil are not the only ones that need water, you do, too. Stay hydrated. Contact Bill Luedecke at The Luedecke Group Realtors at (512) 577-1463 or email him bill@texasland.net. Contact Martelle Luedecke at (512) 769-3179 or luedeckephotography@gmail.com. Excellent article! Now if I can figure out how to keep the sweat from running in my eyes as I do all the essential tasks you've laid out. I am reminded of the old Indian proverb: "You can eat a grizzly bear if you take one bite at a time." And that's how I'll tackle my August chores. Thanks Bill and Martelle!